Welcome everyone, I am so deeply honoured to be able to share animal’s thoughts & feelings on every situation they face in their lives. Animals have great humour, love, joy & wisdom – animals love sharing their insights into their life, their reasons for being, their reasons for any struggles they are encountering; animals are incredibly insightful; animals are truly amazing beings enriching our own lives in every possible way. Due to word of mouth referrals since 2006 I have communicated with animals worldwide – New Zealand, Australia, Pacific Islands, USA, Canada, Europe, UK, Nordic, South Africa & Asia. 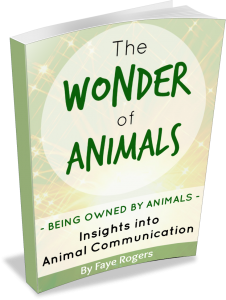 As an Animal Communicator & Healer I have had guest appearances on National Television & Radio Shows – also appeared in National Newspapers & Magazines (NZ & overseas). I am also a published Writer on Animal Communication & Healing sharing messages from the Animal Kingdom. If you would like to interview me please drop me a quick note. I do hold regular workshops. My intention from May 2016 onwards I will be bringing together an Academy of Animal Lovers – a community of like-minded people who all sing the same song of humanity, and I will be offering e-books & e-courses on animals, people & animal healing, and also spiritual awareness & development e-courses & online workshops. So do please keep coming back to check on what is available. Conversations with Pets from Loading Docs on Vimeo. “We planned to shoot the day-to-day life of an animal communicator and wanted to capture a domestic portrait of Faye interacting with her own pets and the everyday conversations that came up. This being a very observational documentary, we were hoping for surprises and we got some. Faye had a frantic call from an American client about a lost kitten so all of a sudden we stumbled upon a remarkable moment where she was communicating with the lost kitten to help him to be found. Faye has never been comfortable having outsiders see her channel a lost animal and so was reluctant at first. Building up trust over the previous day’s shoot meant she was open to letting us film a little bit of her process. From Faye: Little Finn Kitten had been missing for 3 hours before I was contacted, his family had turned their house upside down looking for him – furniture pulled out from walls & every cupboard pulled apart – he was where he said he was – Finn had gone on a big adventure, and had got himself stuck. Squeee…New Zealand Woman’s Weekly got in touch with me for an interview photo-shoot session which meant I got to spend a day hanging out with 4 gorgeous animals & their peeps. 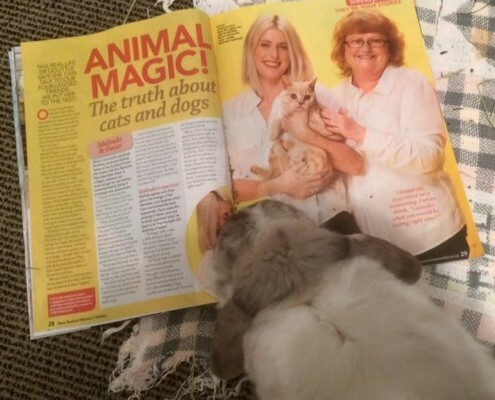 The article ‘Animal Magic! The truth about cats and dogs’ is a 4 page spread promoting that animals are pretty special in their insights. My friend captured her gorgeous Mr Fergus having a looksie at the article…..
That’s me on the right, on the left is stunning duo Oscar & Mallinda.